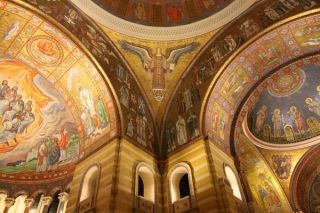 Completed in 1914, the Cathedral Basilica of Saint Louis is renowned for its breathtaking mosaic works - one of the largest in the world. Comprising more than 41.5 million pieces, and covering 83,000 square feet, the mosaics display took more than 75 years to complete. The 2000-seat cathedral's architecture is as exquisite as it is acoustically challenging, capped with a massive dome that soars to 150 feet high at its center. "It's an exceptionally challenging environment," explained Gary Haselhorst, president of Valley Park, MO-based Cignal Systems. "There are so many concave surfaces, with 360 degrees of windows, and the dome just exacerbates everything. There's not a soft surface in there - marble floors, hard pews - and there are transepts on either side that create even more reflections." The Cathedral has struggled to find a sound system that could cope with such a challenging space. "The old system was simply ineffective," said Haselhorst. "They had about twenty 12-inch two-way cabinets around the perimeter, hung at about 30 feet in the air. There was a very fine line between enough volume and too much volume. If we brought up the direct feed too high the room would go into feedback." The solution presented itself in the form of Iconyx digitally steerable column arrays from Renkus-Heinz. A pair of Iconyx IC32-R-II columns are installed left and right of the altar platform. "As proof of concept, we took a single Iconyx 32 into the Cathedral, put it stage right of the altar sanctuary area, and steered the beam away from the reflective surfaces," said Haselhorst. "Even with one speaker, we were miles beyond the existing sound system." The Iconyx also offered a low-profile, streamlined design that blended well with the decor. "We custom painted them to match the walls," said Haselhorst. "We took down twenty loudspeakers that were aimed all over the place, and replaced them with four sources that are aimed with precision. You can hear someone now as if you were talking to them ten feet away."